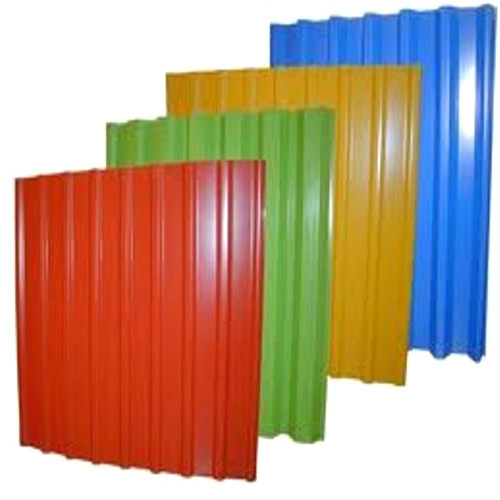 We are offering Color Coated Profile Roofing Sheet to our clients. Established in the year 1980 We, Manmohan Ispat Pvt. Ltd. is a renowned organization engrossed in manufacturing, exporting, trading and importing a broad range of Color Coated Sheet, Metal Sheet, Polycarbonate Sheets, Galvanized Sheets, Metal Purlin, Decking Sheets, Roof Ventilators and much more. These products are designed to be heat resistant and have high tensile strength. We are able to provide our clients with the most durable and corrosion resistant range of roofing sheets and ventilator. In addition to this, we ensure to test the quality of the whole range before delivering products to the clients in order to ensure their accordance with industry accepted quality standards and stand by the expectations of our customers. We are enabled by our team of expert engineers and technicians to fabricate the most durable quality range of products iron and steel products. Working in coordination with our clients, we provide them completely customized solutions for their iron and steel product requirements and needs. In addition to this, for the purpose of manufacturing these products and suit the requirements of the clients timely, we have ultra-modern infrastructure unit. All offered products are stored under several categories in order to retrieve them without any inconvenience and hence ensure faster delivery.